AI-LOCK PLUS: STOP CRIME, don't just record it. STOP CRIME, don't just record it. A single door security system that prevents crime before it happens. AI-LOCK identifies when an individual is wearing a mask, hoodie, cap and shades, helmet or otherwise is covering his/her face and automatically shuts the door preventing entrance of said individual and averting a potential robbery. An Artificial Intelligence videos software that keeps your employees, customers, and business safe. The system is plug and play and stand-alone designed to be incorporated into any type of door. Minimalist design, closed circuit, completely automated with customer interface via WI-FI. High Resolution 720P HD camera module board with casing and bracket for flush door mount. 1,200 Lbs. holding force electric magnetic lock with fail-safe NC Mode. Custom designed Sync Unit with proprietary video analytic face detection software and power supply cord. Motion activated sensors switch with DC coupler cable release button switch panel. 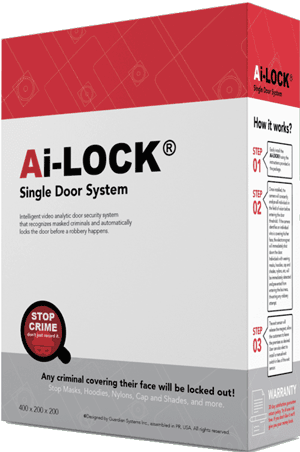 For total control from inside, AI-LOCK includes an exit door strike release button switch. Spot light, HDMI cable, and Warning Decal. ¹Manufacturer's Suggested Retail Price. Installation service only available in the following areas: Florida-USA, Puerto Rico, and the Dominican Republic. Installation costs not included. What type of criminals will the Ai-Lock prevent from entering my business? Any criminal wearing a mask, hoodie, cap and shades, helmet, or is otherwise is covering their face will be detected by the Ai-Lock and it will shut the door automatically before they can enter. These criminals usually are armed and dangerous, keeping your business, employees and customers safe. What happens if a criminal simply waits and tailgates a regular client inside? Most masked criminals enter a business quickly as to avoid detection. If a criminal has to wait to tailgate a customer, the criminal is exposed and arises suspicion, improving the chances to identify him and getting caught. Criminal will simply prefer to target a place where no Ai-Lock is in place. Will the Ai-Lock slow down my entry flow of my business? No. The Ai-Lock detects personas within 4-5 feet of the doorway releasing the door before a client grabs the handle. The client will not even notice the system. Does the Ai-Lock record 24/7? No, but you don’t need to. The Ai-Lock will record an image still of every person that walks into your business. The image is a close-up profile picture that leave no doubt of the identity of the person. You can access these images via any device, phone or laptop by connecting it to the Ai-Lock’s WIFI signal. What is the different between Ai-Lock and Ai-Lock PLUS? With Ai-Lock PLUS the user to create “whitelist” or "blacklist" of authorized personnel for secure access control. Search your answers to your questions in our community or request direct support. Our Customers Support Center is available 24/7 to answer your questions.